The decrease of GBP stopped due to the weakening of USD, caused by Trump’s Administration decision to imply the per cent steel and aluminum import tariff, which can tighten the USA and China’s trading relationship. American fundamental data were mixed: Personal Income grew by 0.4% but Personal Spending – by 0.2%. The Initial Jobless Claims indicator reached the level of 210K, which is below the forecast of 226K. However, the Continuing Jobless Claims value exceeded the expectations and reached the level of 1.931 million. The decrease in Construction Spending and Manufacturing PMI Markit to 55.3 points has also affected USD negatively. Investors are waiting for tomorrow's speech by Teresa May with details of the British Brexit plan. The European version presented yesterday did not satisfy the government of the United Kingdom, which opposes the EU proposals on the Irish borders. Meanwhile, representatives of the Parliamentary Committee on Business, Energy, and Industry warned the Prime Minister of hasty actions, saying that the absence of a deal on Brexit would negatively affect the automotive industry, depriving it of the opportunity to compete with European producers and lead to the loss of a large number of jobs. On the 4-hour chart, the downward movement if in the correction, the instrument is moving sideways within the channel, formed by the lower border and middle line of Bollinger Bands. MACD histogram is in the negative zone, keeping sell signal. Support levels: 1.3750, 1.3710, 1.3680, 1.3600. Resistance levels: 1.3800, 1.3850, 1.3890, 1.3940, 1.4000, 1.4040, 1.4115. Short positions can be opened at the level of 1.3750 with the target at 1.3700 and stop loss 1.3780. Implementation period: 1–3 days. 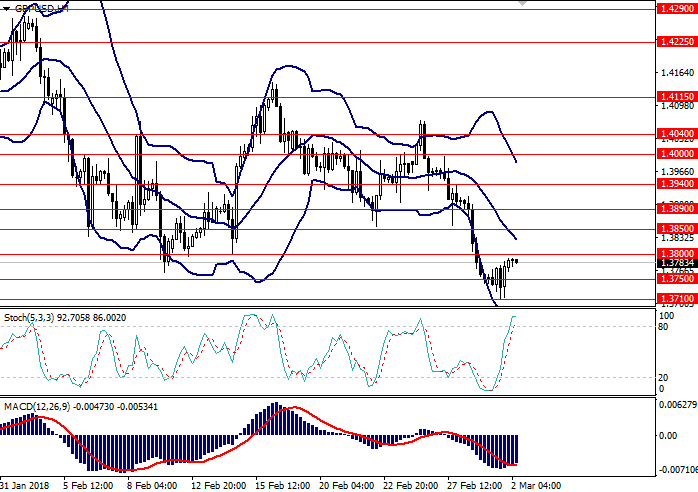 Long positions can be opened at the level of 1.3800 with the target at 1.3850 and stop loss 1.3770. Implementation period: 3–5 days.